Do you love the song My Favorite Things? There definitely should be a phrase or two about Nutella. Seriously, who doesn’t love Nutella? Nutella is one of my favorite baking ingredients. Sometimes I substitute it for melted chocolate chips or cocoa powder. It makes things a lot easier, and there’s just something rich and perfect about the flavor of Nutella chocolate. Don’t worry busy people — I gotcha covered with this recipe! This seriously takes minutes to throw together and you can make everything in one bowl. Very little mess and very little time is involved in baking these Nutella blondies. That’s why this recipe is a mom’s best friend. Got company coming over last-minute? Throw these blondies in the oven and your home will be smelling of homemade treats in no time! My kiddos were quite impressed with the swirls on these blondies. They are quite simple to do! I typically make swirls with a knife, but decided to branch out a little and try it with a toothpick. Much, much MUCH better! The toothpick makes the swirls more crisp-looking and I love that they are skinnier — so no messy blobs that are supposed to resemble swirls. 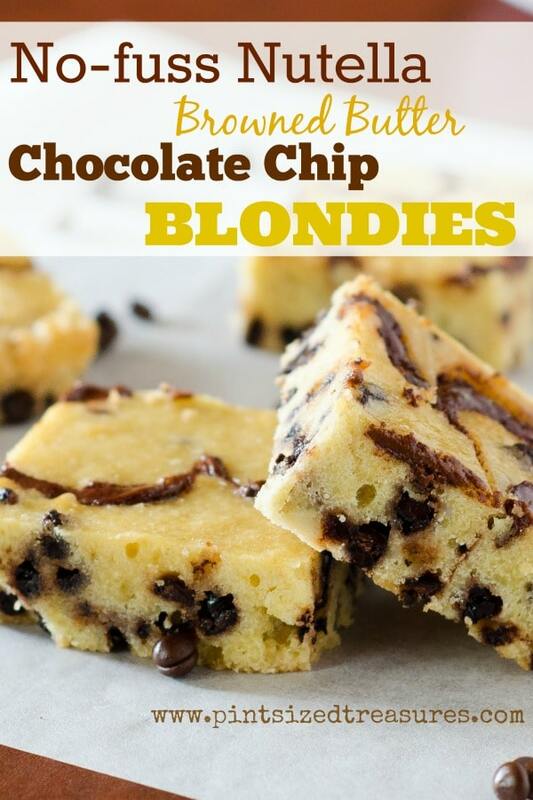 My hubby was trying these goodies the other night and he asked, “What are the ingredients in these blondies?” When he found out how little flour was used, he was shocked. “So, it’s mainly butter and brown sugar.” I grinned — guilty as charged. Butter is expensive around these parts, but oh-so-worth it when you pair it with chocolate. We seriously don’t eat many sweets around here, but I typically snag a pic or two when we do, so I keep the sweets coming on the website. In fact, the website is kind of an excuse to get some sweets in the oven. Now you want a blog of your own too, right? Any excuse to convince your hubby sweets should be a tri-weekly thing! Are you a brownie or blondie fan? I’m a friend of both. No preference here. I prefer brownies, swirled with marshmallows and of course nuts! 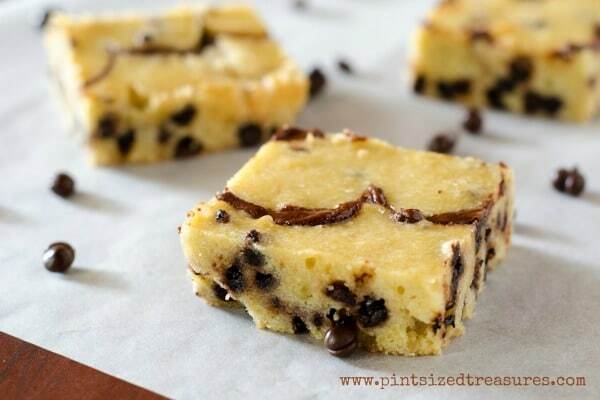 Blondies are perfect with chocolate chips and chocolate swirls. Hey, if it’s baked — it needs chocolate! Another aspect of this rich recipe that i love is that it doesn’t use baking powder or baking soda in it. I just love biting into a sweet, cheat food and not getting that baking soda/powder taste. I know I am probably too picky about that one, but still — it’s true. I love a short ingredient list for cookies, cakes, brownies or bars. It just seems more like real food when the ingredients list is super-short. Ready for a chocolaty, Nutella recipe that is super-rich and uses few ingredients? Gotcha covered! Preheat oven to 350 degrees Fahrenheit. Next, lightly grease and flour an 8 x 8 baking pan. In medium-sized mixing bowl, combine first four ingredients and stir. Next, stir in flour just until thoroughly combined. 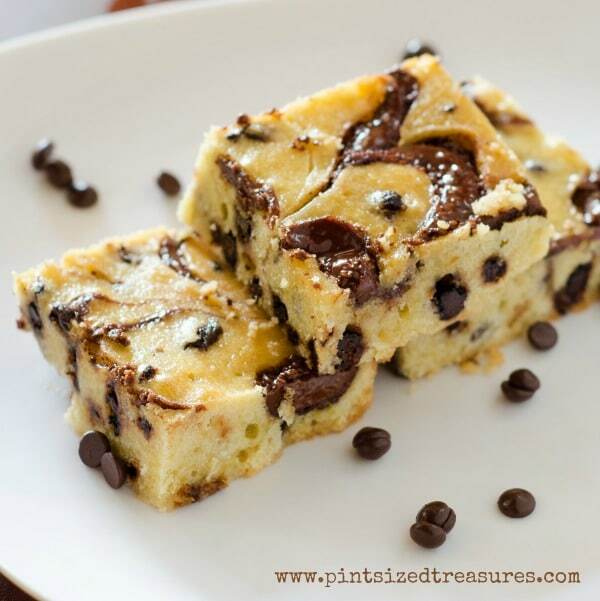 Next, fold in chocolate chips. Now, pour blondie batter into prepared baking pan. Then, break out your Nutella jar and scoop out about 1/3 cup. With a spoon, gently pour over brownies in five straight lines, horizontally. Then, using a toothpick, draw vertical lines in the blondies to create a marbled pattern. Now, you’re ready to bake! Bake for 20-25 minutes and let cool before cutting. Enjoy! Yields: 12 Blondies.